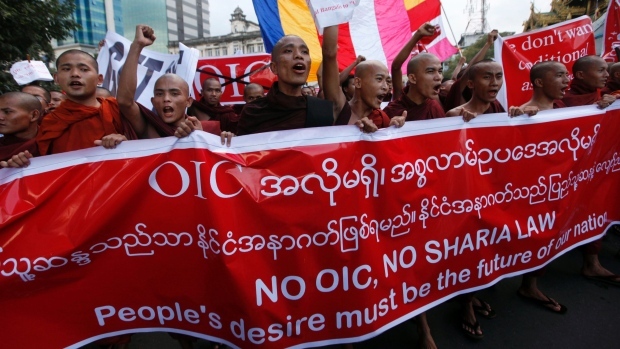 JNN 21 Jan 2015 Yangon : Hundreds of protesters led by Buddhist monks rallied in Myanmar on Friday to denounce a visit by a human rights envoy of the United Nations, which has urged the government to grant citizenship to persecuted Rohingya Muslims. Crowds roared and pumped their fists in the air as Ashin Wirathu, a extremist monk known for railing against Muslims, delivered an impassioned speech in Yangon attacking the U.N. and its Special Rapporteur on Myanmar, Yanghee Lee, who is concluding a 10-day visit, Reuters reported. “The despair that I saw in the eyes of the people … was heartbreaking,” she told reporters on Friday. This entry was posted in Asia Pacific and tagged buddhist monks, Muslims, Myanmar, Rohingya Muslims, United Nations, Yanghee Lee, yangoon. Bookmark the permalink.